Neymar has again suffered an injury to his metatarsal bones. 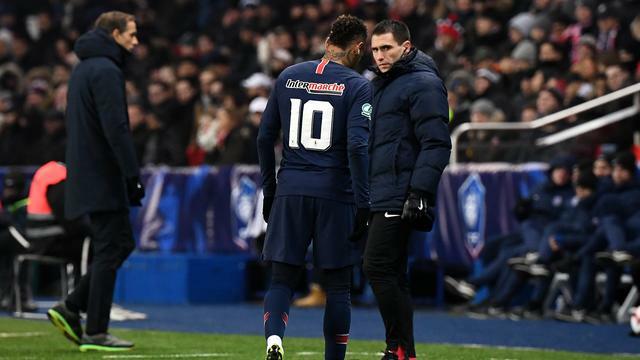 The attacker of Paris Saint-Germain sustained the injury Wednesday in the cup match against RC Strasbourg. The 26-year-old Neymar stumbled to the side crying after a little more than an hour of playing after a kick on his right ankle. Research at the hospital showed that there is not so much damage to his ankle, but especially to his foot. "The pain is on the spot where he broke a bone last year", PSG reports in a brief statement on Thursday. "The next few days we will see how he should be treated." In February last year, Neymar sustained a broken metatarsal bone. The Brazilian had to undergo surgery in his own country and was out of circulation for almost three months. Eventually he was fit for the World Cup just in time. "The doctor and Neymar are worried", trainer Thomas Tuchel of PSG said after the cup game. "It is the same foot and the same metatarsal as last year." The 96-time international threatens to miss the first meeting with Manchester United in the eighth finals of the Champions League. PSG and United meet each other on February 12 at Old Trafford. The team of Tuchel defeated Strasbourg 2-0 on Wednesday-evening and qualified for the eighth finals of the Coupe de France. Edinson Cavani and Ángel Di María were accurate. In the Ligue 1, Paris Saint-Germain is firmly in the lead. The gap on number two Lille, which has played two more games, is thirteen points.